Hiway decided to return to simplicity for a new range of gliders, with no wing wires. Hiway designed the airframe to fles in a particular way under flight loads, and then sew the sail to fit the shape exactly. 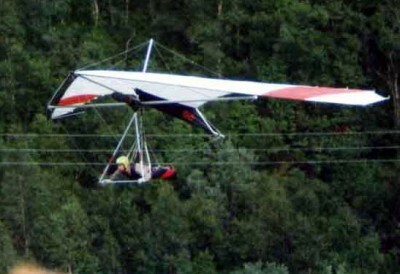 The first of the range were 1) Super Scorpion, a cross-country hang glider. 2) Spectrum, intermediate glider. 3) Gemini, purpose designed two-place glider. 4) Harrier, primary and training glider. 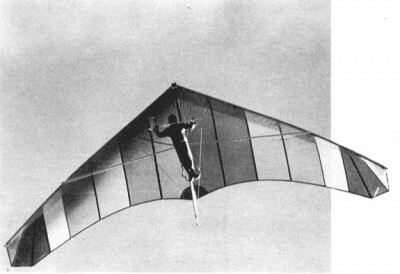 The Scorpion was a 1978 hang glider from Hiway Hang Gliders. The 1978 Super Scorpion glider had lightest handling ever made, but an abysmal sink rate at speed and tail heavy balance that can feel cumbersome at take off (but often useful for landing). 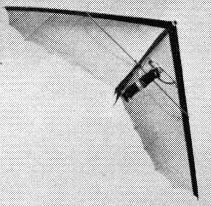 Paddy Monro was one of the many test pilots for Hiway and considered the Super Scorpion was an improvement on the Scorpion. The "C "was the best version. Best glider and best seller in its day. The Super Scorpion C was top rated for manuverability and sink rate at its time. A very easy and safe wing, even withou lufflines. The downside was a lack of speed: over 40 km/h, it sank like a rock and a tendency to skid serious if turned with too little speed. The Super Scorpion had a further 1980 development called the Super Scorpion II. Visually the difference was the II had completely straight uprights. The earlier version I own has curves on each upright at the very top so that they end up parrallel to each other where connected. This glider is very sweet to fly having very pleasant handling qualities. Its only real drawback was a lack of penitration compared to some other gliders.